Eragon (Edward Speleers) is a young farm boy who finds a blue stone in the mountains. The stone turns out to be a dragon egg, and Eragon soon bonds with the dragon and discovers that he's one of the last Dragon Riders. Later, Eragon's family is killed by the marauding Ra'zac, and he must learn to fight before a war begins. Now that The Lord of the Rings has made cinemas safe for fantasy epics, we seem likely to get more flicks in that genre. Enter 2006’s Eragon, a film based on the first entry in Christopher Paolini’s Inheritance trilogy of novels. Will the series of pictures continue? Based on the performance of Eragon, that prospect seems questionable. Whereas each Rings movie made more than $300 million in the US, Eragon topped out at $74 million. Not exactly the kind of numbers that inspire suits to greenlight more expensive efforts like this. A prologue tells us that dragon-riders once ruled and defended the land of Alagaesia. However, the eventually become obsessed with power, and a rider named Galbatorix (John Malkovich) tried to kill all the other men and dragons in a big fight. He apparently eliminated all opposition and led the land with an iron hand. Freedom fighters called the Varden want to remove Galbatorix from power, and a babe named Arya (Sienna Guillory) steals a precious stone of his. When his forces come upon her, she uses a spell to transport the stone elsewhere. It ends up in the possession of a young farm boy named Eragon (Ed Speleers). Before long, he discovers it’s not a stone; it’s an egg that hatches a baby dragon. Galbatorix worries that if the Varden learn of this event, it’ll inspire hope, so he dispatches his minions to kill Eragon before he matures. A “shade” named Durza (Robert Carlyle) leads these baddies. It doesn’t take long for the dragon to grow up, though, and she soon telepathically tells Eragon that her name is Saphira (voiced by Rachel Weisz) and he needs to serves as her rider. Village bum Brom (Jeremy Irons) foresaw these events, and he acts as Eragon’s mentor. The movie follows his reluctant training and eventual battles. Eragon represents Stefen Fangmeier’s first effort as director. In the past, he worked as visual effects supervisor on a mix of big projects like Lemony Snicket’s A Series of Unfortunate Events and Signs. I suppose his promotion makes some sense given the heavy emphasis on effects in Eragon, but from a story-telling point of view, it becomes tough to detect Fangmeier’s credentials. Have any other folks with an exclusive visual effects background become successful directors? Not many. Cinematographers often make the leap, and writers can jump as well, but I can’t think of many effects guys who succeeded as directors. Joe Johnston heads that list, and after him… well, it’s a short list. Perhaps eventually Fangmeier will prove himself as a director, but based on the evidence found in Eragon, I wouldn’t count on it. At best, Fangmeier provides serviceable direction. At worst, he seems stiff and wooden. Character delineation remains negligible at best, and the story plods at a stilted pace. There’s no smoothness or clarity to what we see. Instead, the film just bumbles along as it follows some fairly inevitable paths. Granted, it might be unfair to blame Fangmeier for all these problems, as the source material may cause many of them. To be sure, Eragon offers an almost ludicrously derivative piece of work. Going in, I knew that many viewed it as a blatant rip-off of the Lord of the Rings series, and I can clearly see that influence here. Tolkien doesn’t provide the sole inspiration behind Eragon, though. Indeed, you’ll find many influences at work here, with a strong emphasis on Star Wars. I might even think there’s more Lucas than Tolkien behind Eragon, as a number of strong parallels appear. We can also easily find a little Dragonheart as well as some other pieces. Whatever the case, all of these factors strip Eragon of any potential to become its own movie. It takes a little of this and a little of that to make a lot of nothing. The end result comes across as terribly generic and never manages to form its own identity. Truly, Eragon feels like fantasy by committee. It takes a melange of different elements but lacks inspiration and originality. It also fails to thrill or excite. While perfectly watchable, the result is a flat, bland tale with little to make it stand out from the crowd. If we get no continuation of the saga, I’ll feel bad for fans. The conclusion of Eragon clearly points the way toward more flicks; ala the first two Rings movies, the ending doesn’t present a remotely conclusive finale. However, I can’t say I’ll be too sad if I don’t get to watch more adventures of Eragon and his pals. The first chapter is pretty forgettable and doesn’t inspire me to hope for more. 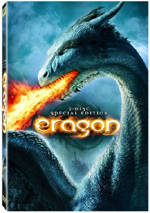 Eragon appears in an aspect ratio of approximately 2.35:1 on this single-sided, double-layered DVD; the image has been enhanced for 16X9 televisions. Although many shots looked great, some nagging concerns made the picture less than stellar. Dark segments were the main concern. Low-light shots tended to be somewhat dense and tough to delineate. These weren’t horribly opaque, but they created distractions, especially since the movie featured so many shadowy sequences. Much of the rest of the transfer was pretty good. Blacks seemed reasonably tight and full, while sharpness was usually fine. Wides occasionally appeared a little iffy, but the majority of the movie depicted good clarity. No issues with jagged edges or shimmering materialized, but light edge haloes occurred. At least no source flaws marred the presentation. Colors worked well. The movie went with a fairly full palette, though it favored greens and browns. The tones looked somewhat stylized but seemed strong within those parameters. Without the excessive darkness, this would’ve been a good image. Unfortunately, the problems with shadows made the presentation issues and left the transfer with a “C+”. No such complaints greeted the audio of Eragon. 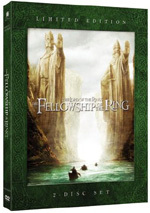 The DVD presented both Dolby Digital 5.1 and DTS 5.1 soundtracks. If any variations occurred to differentiate the pair, I couldn’t discern them. I thought the pair sounded identical. Since they were so solid, I won’t gripe. From start to finish, the flick offered a very involving soundfield. The many action sequences brought all five channels to life quite well, as dragons and battles zoomed around us. The elements moved smoothly and created a full sense of the environment. Music also boasted fine stereo delineation. I found the quality of the audio to work nicely as well. Speech was always natural and concise, with no edginess or other issues. Music seemed bright and lively, while effects excelled. Those elements came across as full and rich, without distortion or problems. Bass response seemed deep and tight. These mixes served the film well and gave us some fine material. 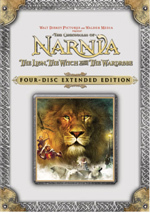 A mix of extras fills out this two-disc set. On DVD One, we find an audio commentary from director Stefen Fangmeier. He offers a running, screen-specific discussion. The director covers story and editing choices, cast, characters and performances, sets and locations, visual design and related topics, stunts and effects, and other production subjects. Like the film itself, the commentary proves serviceable but not memorable. I can’t fault the choice of topics Fangmeier selects, and he provides reasonable detail about them. However, the track simply never becomes very engaging. Fangmeier delivers a decent overview but not a particularly involving discussion. DVD One also includes some previews. We get an ad for Night at the Museum and a montage for Fox family DVDs. Over on DVD Two, all the supplements come under banners that represent story locations. Carvahall gives us two elements. Inside the Inheritance Trilogy: The Magic of Eragon provides a six-part documentary; taken all together, the show runs 51 minutes, 31 seconds. It mixes movie clips, behind the scenes elements and interviews. We hear from Fangmeier, novelist Christopher Paolini, screenwriter Peter Buchman, producer Wyck Godfrey, ILM visual effects supervisor Samir Hoon, ILM animation supervisor Glen McIntosh, Weta visual effects supervisor George Murphy, ILM digital compositing supervisor Dorne Huebler, and actors Jeremy Irons, Ed Speleers, Sienna Guillory, Garrett Hedlund, Djimon Hounsou, and Gary Lewis. We learn about the development of the books and the first one’s adaptation for the screen, character design, early pre-production, locations, sets and creating a fantasy universe. From there we go through casting and performances, elements from the shoot such as dealing with the elements and working with animals, stunts and fight scenes, and various effects. In addition, the program examines costumes and makeup, logistical challenges, photographic choices, creating Saphira, and looking ahead. As a whole, “Magic” offers a decent look at the production. It gives us lots of good shots from the set, and it provides a reasonable amount of information. I can’t say it goes into great depth, as the show maintains a moderately superficial feel much of the time. Nonetheless, it goes through the appropriate issues with acceptable detail and becomes enjoyable. Also in “Carvahall”, we find Eldest – The First Two Chapters. This text piece offers a glimpse of the second book in the series. I guess this makes it worthwhile for fans of the movie who’ve not read the books and who want to know where the story will start to go. It seems kind of pointless to me, though; if you’re interested, just buy the stupid book! Daret includes one component: The Inhabitants of Alagaesia. A series of six short components, Fangmeier narrates as we learn about the design and personality issues that affected the various characters as well as performance notes. Taken together, these pieces fill 19 minutes, 26 seconds. The information accompanies conceptual art and photos. The visual elements offer some interesting components, especially when we see the various possibilities for the dragon. Fangmeier’s comments help make this a useful piece. Within The Spine, both pieces relate to “The Vision of Eragon”. These show elements Fangmeier created to sell his take on the story to the suits at Fox. An Animatic Sequence for “Arya’s Ambush” runs four minutes, 36 seconds. We can watch this with or without commentary from Fangmeier. It shows an early version of the scene and Fangmeier provides info into his decisions via this reasonably interesting component. In addition, we find a Conceptual Artwork Gallery. This presents the illustrations as a running three-minute and 18-second compilation. It shows planning drawings accompanied by more chat from Fangmeier. Though we saw some of the art in “Inhabitants”, additional pictures pop up here, and Fangmeier’s commentary allows us a little extra insight. With that we head to Gil’Ead and its collection of Extended and Deleted Scenes. We get seven of these with a total running time of 12 minutes, 28 seconds. They include “The Butcher’s Daughter” (2:38), “The Farm Fight/’We Don’t Take Charity’” (2:09), “Roran and Katrina Say Goodbye/The Butcher Changes His Mind” (1:42), “Milking the Cow” (0:30), “’We Can Learn a Lot from Each Other’” (1:16), “The Son of a Traitor/The Twins’ Test” (3:02) and “The Magic of Blessings” (1:08). We find a cut character in Katrina, the butcher’s daughter; she’s a babe but the role doesn’t add anything to the film. We also find more from Eragon and his family, elements that flesh out that side of things in a minor manner. None of the remaining bits contribute significant action or information, so don’t expect much from them. We can view the scenes with or without commentary from Fangmeier. He gives us remarks about the segments, their shooting, and why they didn’t make the final cut. Fangmeier proves useful as usual and elaborates pretty well about the scenes. Teirm throws in three components. Pronunciation Guide covers a few screens of text as it tells us how to pronounce various terms in the movie. It also shows us translations of various languages. This should be a fun extra for fans, though it does nothing for me. Next we get Original Storyboards and The Lost Storyboards. The former covers six scenes and presents the boards as still frames. Across the six sequences, we get a total of 106 screens of images. The art ranges from rudimentary to quite detailed, and the various boards are interesting to follow. As for the “Lost Storyboards”, these cover four scenes not found in the final film. All together, they fill 53 screens. All of them look at the early period of the relationship between Eragon and Saphira. Because they don’t appear in the movie, they’re more intriguing than the other boards, though none of them offer terribly significant elements. In Hadarac Desert, one element arrives: Saphira’s Animation Guide. This two-minute and 21-second piece comes with commentary from Fangmeier. He gives us details about Saphira’s design and execution while we look at drawings used to execute the character’s specifics. I like the insight into this side of the animation process. Under Uru’Baen we discover a chat with the author. Eldest – Christopher Paolini Interview goes for four minutes, 17 seconds as he discusses the developments in the series’ second book. Since this novel is already on the shelves – and has been out for quite some time – I’m not sure what purpose this overview serves. He throws out a few minor notes about the third book, but there’s not enough to make this a worthwhile piece. Indeed, it could be a spoiler for fans who’ve not read Eldest. Beor Mountains contains promotional elements. We find both teaser and theatrical trailers plus ads for “Fox on DVD”; that domain includes clips for Planet of the Apes, Kingdom of Heaven and “TV Action”. We also locate Become the Dragon Rider – Creating the Video Game. The three-minute and 13-second featurette includes comments from Fangmeier and videogame design director Ray Gresko. They discuss the development of the game and its connections to the movie. While we get a couple of interesting notes, the clip really exists as an excuse to sell us on the game. Finally, Farthen Dur presents a series of 19 featurettes under the banner The Secrets of Alagaesia. Here visual effects supervisors Michael McAlister and John Van Vliet discuss their work on the film and how it relates to the creation of various elements. All together, the 19 clips fill a total of 44 minutes, 26 seconds. McAlister and Van Vliet lead us through a variety of shots as they go through different stages of computer effects. We get a nice look at the steps that come along the way to form the final clips. Though the commentary gets a bit dry at times, the information remains strong and the visuals offer a fine illustration of how CG works. If you feel like you’ve seen Eragon before, that’s because it borrows so liberally from other superior offerings. The movie takes fistfuls of elements found in better flicks and renders them impotent in this generic, dumbed-down fantasy tale. The DVD presents lackluster visuals but compensates somewhat with excellent audio and a very nice set of supplements. I can’t endorse this bland, forgettable fantasy flick. Pursestrings note: if you want to save a few bucks, a single-disc version of Eragon appears on the market. It retails for about $5 less than this two-DVD set, and I’d guess that it simply packages Disc One from the Special Edition.